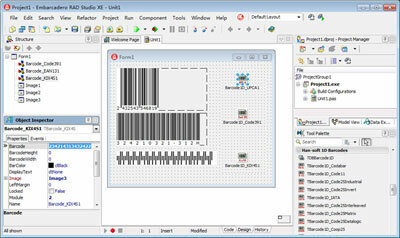 The 1D Barcode VCL components is a set of components designed for generating and printing barcode in your Delphi or C++ Builder applications. Developers use the components set like any other VCL component. This effective and powerful components set extends your applications with barcode technology. Most popular linear, clocked and postal barcode symbologies are supported including Codabar, Code11, Code25 family, Code32, Code39, Code93, EAN-2, EAN-5, EAN-8, EAN-13, UPC-A, UPC-E, Code-128, EAN-128, MSI, ITF, DPI, DPL, Flattermarken, Pharmacode, Postnet, Postbar, OneCode, Telepen, Plessey, KIX4S, Planet, RM4SCC, FIM, IATA etc. Also, The 1D Barcode VCL components can be used together with 2D Barcode VCL Components package to create the EAN.UCC composite barcode symbols. The database functionality is supported. The QuickReport, ReportBuilder, FastReport, and ACE Reporter are supported too. Applications using the components set can then be deployed royalty free. All modern Delphi and C++ Builder are supported, from Delphi 3 to Delphi 10.2 Tokyo, and from C++ Builder 4 to C++ Builder 10.2 Tokyo. Features: 1, Allows to draw the barcode symbol to canvas or print the barcode symbol to paper. 2, Most popular barcode symbologies are supported. 3, Check digit is automatically calculated and added. 4, All of the Quick Report, Report Builder, Fast Report, Rave Reports, and ACE Reporter are supported. 5, All modern Delphi and C++ Builder are supported, from Delphi 3 to Delphi 10.2 Tokyo, and from C++ Builder 4 to C++Builder 10.2 Tokyo. 6, The database functionality is supported. 7, Ability to scale and rotate the barcode symbols. 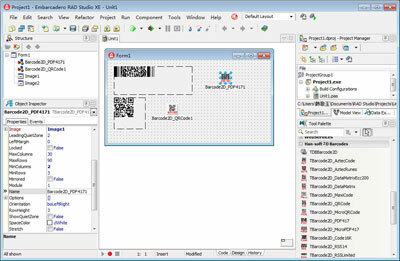 8, Ability to create the EAN.UCC composite barcode symbols together with 2D Barcode VCL Components package. 9, The 64-bit platform is supported under Delphi XE2 - 10.2 Tokyo and C++ Builder XE3 - 10.2 Tokyo. 10, Optional human readable text is supported. Version 9.2.4.2146 fixes several encoding problems. Optimizes encoding method. The RAD Studio 10.2 Tokyo hotfix is supported. Fix several encoding problems. Optimize encoding method. The RAD Studio 10.2 Tokyo hotfix is supported. The RAD Studio 10.2 Tokyo is supported. Version 7.1.0.2075: RAD Studio 10.1 Berlin Update 2 is supported. 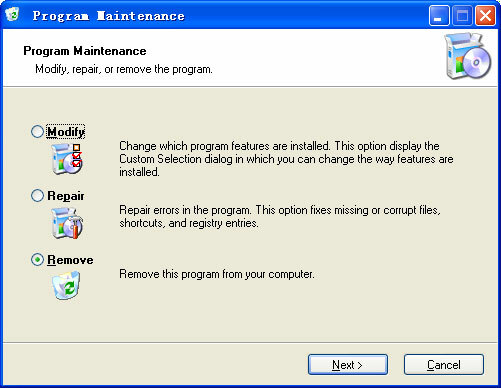 Version 7.1.0.2070 may include unspecified updates, enhancements, or bug fixes. Version 6.0.1.2015 may include unspecified updates, enhancements, or bug fixes. Version 5.0.1.1983 may include unspecified updates, enhancements, or bug fixes. Version 4.0.3.1969: Re-designed the component structure and support Delphi XE3 and C++ Builder XE3, Channel Code, JapanPost, UPU, and Patch Code. Version 4.0.1.1870 adds support for Delphi XE6 and C++ Builder XE6.